9.32AM: QUEENSLAND Parks and Wildlife Service crews are at the scene of a grass fire still burning in Mount Stowe State Forest near Reid Rd at Yarwun this morning. The fire is expected to burn for several more days. There is still not threat to property at this time and The Observer understands not every property on Mount Stowe Rd was door-knocked yesterday evening. A large amount of smoke remains in the area, and Queensland Fire and Emergency Services have reiterated yesterday's warning that nearby residents should keep doors and windows closed. People with respiratory conditions should keep medications close by, and anyone concerned their property may be under threat should call Triple Zero (000) immediately. 6.09PM: FIREFIGHTERS have been unable to keep this afternoon's massive bushfire at Yarwun from entering Mount Stowe State Forest. 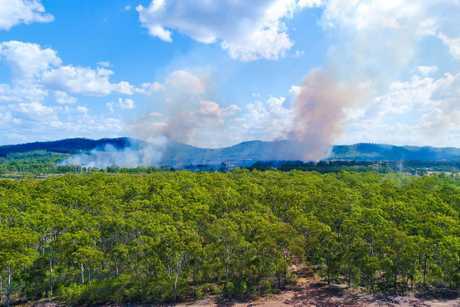 The blaze burned through about 70 acres of bushland after starting in the rail corridor at West Stowe, at one point being fought by at least eight rural fire brigade units from across the region as well as Gladstone's two urban fire trucks. A grader was brought in in a last-ditch attempt to keep the fire from reaching the forest, but a wind change late in the afternoon meant firefighters had little chance of stopping it in its path. Westowe Rural Fire Brigade first officer Danny Devers said the fire was now burning inside the forest and firefighters had left the scene to formulate a long-term plan to protect nearby properties. "We're going to have to let it burn and notify anyone living nearby," Mr Devers said. "It's about 3000 acres so we don't want to backburn into it, and a lot of that area you can't access, so we're just in a watching mode right now. "We'll have vehicles running around and keeping an eye on it over the next few days, and if it does come out we'll work to contain it there." People living on properties on Calliope River Rd and Mount Stowe Rd are expected to be notified of the firefighters' plans shortly. Mr Devers said the long-term hope was that if the blaze stays contained to the forest it will eventually burn itself out due to a lack of dry fuel. "This forestry has been burnt twice over the last five years," he said. "The last time it was a three-day effort, but we did burn around the perimeter then so we're hopeful there's not too much there to fuel this one." Mr Devers said smoke would remain in the area for the next few days, but it would not be as severe as the dark cloud which rose above Gladstone this afternoon. "With a bit of dew overnight that smoke should ease up... and the wind is predicted to stay blowing over Yarwun and Westowe," he said. The initial cause of the fire remains unknown. West Stowe drone footage: The grass fire is believed to have started in the rail corridor. 3.26PM: QUEENSLAND Fire and Emergency Services have issued a bushfire warning for Yarwun concerning this afternoon's blaze, which is burning across a large area near Reid Road. The warning specifies smoke may be seen in the surrounding suburbs, as well as from Gladstone. Residents are advised to close their windows and doors and keep medications close by if they are suffering from a respiratory condition. Anyone concerned their property is under threat should call Triple Zero (000) immediately. Firefighters on the scene are still struggling to contain the blaze and have requested back-up from two further rural units from Mount Larcom. A spokeswoman from Orica said the fire is about two kilometres away from its Yarwun chemical plant and is regarded as being in the "safe zone". 2.21PM: BACK-UP rural units from Benaraby and Calliope are on their way to West Stowe to help fight a massive grass fire heading for Mount Stowe State Forest. Firefighters are in an intense battle with the blaze, at one point retreating to safe ground after a power pole supporting a transformer exploded. A grader has been organised to cut the fire off from Mount Stowe State Forest and more water supply has been called in for rural units on the fire's western flank. 1.47PM: FIREFIGHTERS are battling to contain a massive grass fire at West Stowe, on the western side of the Calliope River near Gladstone. Thick black smoke is rising from the fire as it heads towards the Mount Stowe State Forest. The fire has jumped rail lines and is burning on both sides of the rail corridor, where the fire is believed to have started shortly before midday. Gladstone's two main urban fire units, as well as four rural units from the Mount Maurice and West Stowe rural brigades, are currently fighting the blaze. The Observer understands further help has been requested from other nearby rural units. 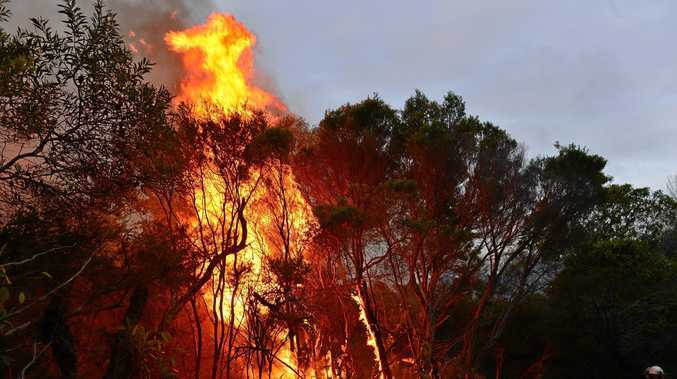 A Queensland Fire and Emergency Services spokeswoman said dispatchers had not yet been informed of any properties under threat.